HFT Finance Review, Dangerous HFT SCAM Exposed With Proof! 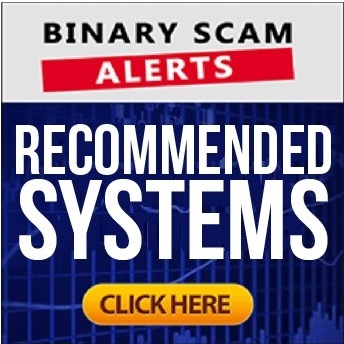 Binary Scam Alerts » HFT Finance,Scam Reviews » HFT Finance Review, Dangerous HFT SCAM Exposed With Proof! The HFT Finance software by John Williams Founder and CEO of HTF Finance Group is a BLACKLISTED SCAM, and our fair and impartial review will provide all the facts, proof, and evidence required to validate our claims. First, a word of caution. This fake app and auto-trader is being promoted by crafty affiliate marketers sending massive amounts of SPAM. In fact, that is their specialty and their links are infected with spyware according to some of the complaints we received. Please refrain from clicking on any of the links and immediately unsubscribe from receiving further communications. If you think this trading robot is legit or genuine you are wrong, and will end up paying the ultimate price. One of our most trusted sources who is employed by a very prominent broker has specifically warned us that this latest scam is designed with pure malice and steals money in a very sneaky way. Keep reading our revealing review and investigation, to see how we expose these crooks and show you what methods they use to defraud and victimize innocent day-traders. Below you will find a screenshot of the testimonial section in the HFT Finance sales page. 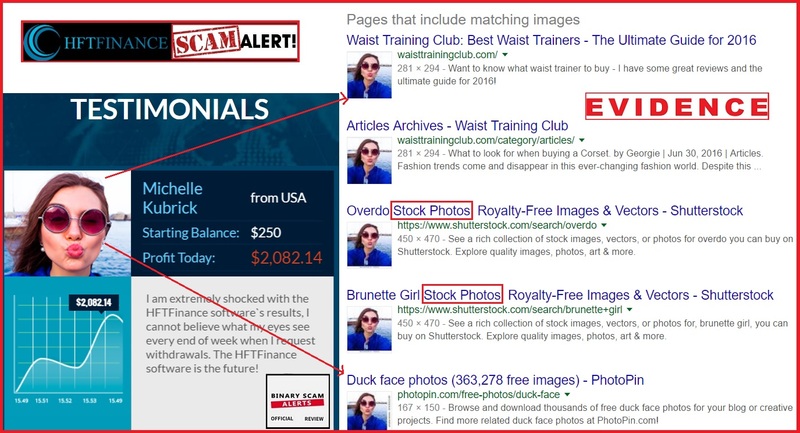 As you can very clearly see the testimonials are fake and taken from an image bank (with or without permission). Additionally, all the components required to put together a classic scam are clearly evident. As illustrated below, we see hyped up claims of “zero risk” and 100% guaranteed wins. In other words, they are saying you CAN NOT LOSE, but we all know trading is risky so that’s a verified lie. Another fabrication has to do with the fake news clippings. A simple Google check will reveal HFT Finance was never in CBS News, Bloomberg, or CNN Money. Then we continue with the fake certifications, the worst one being that the site is HTTPS secure when in fact it is completely susceptible to simple hacking attacks. This is done in order to instill trust, but this lie is so blatant that its just gullible to even try to make these fallacious claims. John Williams, the founder and CEO of HTF Finance Group is giving away free access to 50 new action takers who want to transform their lives and make life-changing profits at the click of a mouse. Williams claims he and his team of elite brokers and analysts worked to JMorgan, Goldman Sachs, and Morgan Stanley Investment Banks where they learned the secrets of the trade and how HFT or High Frequency Trading can generate massive amounts of money. The HFT Trading Robot they developed uses automated algorithms to generate profits at around “98.6% accuracy”. He claims the software is immensely successful due to 2 reasons. The first is speed, followed by a high accuracy rate. He states that having access to this software is like having your own ATM machine and having the option of cashing out money when you want. Then he mentions that the way they make money is by collecting 3.5% of the profits at the end of 30 days every month, and that they are approved by the non-existent “FXCA” financial organization (we checked it already – feel free to do it as well). In reality we are witnessing a lot of hot air and exaggerated claims designed to get you to register with and fund a trading account with one of their recommended brokers. In our case it was G8investing, a new broker we have never heard of until now and seems very fishy to us at first glance. Despite their bold claims their service is NOT HTTPS secure, the testimonials are totally fabricated, the bank account balances are inflated and not real, and the main presenter is a paid actor who performs at the behest of the online promoters pulling the strings behind the scenes. That’s another lie. It’s gonna cost you at least $250 to get started and that money will be charged to your credit card by the broker which is assigned to you which may or may not be regulated. HFT is basically supercomputers performing a massive amount of trades in milliseconds. This method of trading has recently come under scrutiny by law makers and industry leaders who claim it exploits a technological loophole which allows it to sample market conditions and execute trades based on information which is processes via trading algorithms. HFT has nothing to do with this SCAM, they are just piggybacking on this concept in order to peddle their filthy app. The hottest viral scams being marketed online today are Tesler App and Quantum Code. If you are not sure which system is right for you it’s with good reason. The amount of fake apps hitting the markets these days is astronomical and growing all the time. Fortunately we have compiled a short list of the best and most consistent money-making machines after conducting a series of tests and making sure these are the most reliable systems. These apps are all proudly showcased in our recommended section. The HFT Finance software by John Williams is a SCAM, and we had no choice but to blacklist the fake app and trading robot. In our honest review and investigation we have produced ample proof and evidence which has lead us to the unfortunate conclusion that we are dealing with a dangerous financial scam out to steal your money. The affiliate marketers operating behind the scenes are conspiring with dirty offshore brokers to defraud you and commit credit card fraud. Complaints indicate traders were suddenly charged for various purchases that were made online without their consent, which is the classic modus operandi for online scams. We understand why you may think this system is legit or genuine, but if after reading this review you still feel the same way it may be the right time for you to consider other means to generate income. In light of our findings and incriminating evidence, we are currently advising our members and viewers to refrain from using this fraudulent software and seek alternative means of investing. We are also available to answer your questions through our Facebook Group and YouTube Channel.